Last summer seemed to be much more humid and hot than any summer I remember. A “Make your own AC unit” video on YouTube went viral, so we decided to try it. After $30 worth of materials and 50 pounds of ice, the experiment was a success. Too bad it only lasted two hours. So what’s a better option for a long term-solution? An air-conditioning system, of course! 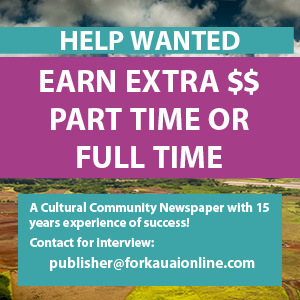 “For a lot of Kauaians it’s becoming more a matter of being able to live comfortably in their homes and workplaces rather than merely survive the heat waves of Kaua‘i’s year round weather” said Colby Ayonon, owner of Kaua‘i Air Conditioning & Refrigeration. Cyndi and Bobby “Airbob” Ayonon, Colby’s parents, founded Kaua‘i Air Conditioning & Refrigeration in 1991. It was essentially a two-man operation until 2005, when Colby and wife Maja Ayonon graduated from college and decided to run the business. Perhaps transform would be a more accurate description, because today, Kaua‘i Air Conditioning & Refrigeration has grown by more than 1,000 percent. Their future is cool and bright. So how did it begin? Maja attended university at Linfield College in Oregon as a business management major. Enticed by reuniting with his high school sweetheart and getting to play soccer with a renowned coach, Colby also attended Linfield College. He double-majored in applied physics and mathematics, and envisioned his future as a mechanical engineer. In 2005, the couple decided to spend one last summer on Kaua‘i before Colby would pursue his masters degree in mechanical engineering. However, once on island, Colby got motivated to take on the family business. Spending time on island with his parents, his wife and his beloved role model, grandfather John Sanchez, weighed on his decision. Quickly, Colby recognized the need for growth. Clients were waiting months for a new air conditioning system, so Colby hired another technician. Maja became the office manager and ran the behind-the-scenes activities. The business expanded to include commercial buildings. Moreover, Colby transformed the business by education and changing the culture of air conditioning. The answers contribute to the overall efficiency of an air conditioning system — and keep the bills lower. A holistic, efficient air-conditioning system may cost more than a window unit. However, it may pay itself off in a year, besides decreasing its environmental impacts. This approach has led to islandwide recognition and several awards. Colby and Maja attribute their success to each other, their team and family. “I believe that my entire team, from my office manager Joanna Daligdig who keeps our day to day business afloat, to my technicians who work tirelessly day in and day out sometimes 24 hours a day, to my parents who started this all, to my wife who does all the behind-the-scenes work, to my mentors who have help guide me and mold me into who I am today, and most importantly to our customers who have made us who we are today,” Colby said. Colby shared three tips to keep an air conditioning unit running efficiently: Regularly changing your air filter can lower your energy consumption by 5-15 percent; if you have a split system, clear debris and leaves from the compressor, fan and condenser; and if your coil fins are bent, use a fin comb to straighten them for proper air flow. Additionally, Maja helped to develop a protective coating, called HVAC guard, that extends the life of a unit for up to five years. Kaua‘i Air Conditioning & Refrigeration is at 1021 Kamalu Rd. in Kapa‘a. They are open Monday to Friday from 8 a.m. to 4:30 p.m., and can be reached at colby@kauaiacr.com or 822-2770. Visit www.kauaiairconditioning.com for more information. Ava Wilkinson is a Realtor who loves the art of human connection. Visit her blog at IsleHome.com and contact her at Ava@IsleHome.com.